The market has been very strong this year, but is it now time to get aggressive with your trades? Despite some concern over a yield curve that has recently flashed inversion, there are reasons to believe this current bull market rally can go higher still. Review: You Risk How Much Per Trade? Our previous Stock Exchange asked the question how much do you risk per trade? We noted that risk management is an important part of any trading program, and that concentration can lead to great success, but also great disasters. We shared some suggestions on sizing and concluded with the importance of knowing your needs as well as balancing prudence and aggressiveness. This Week: Is It Time To Lever Up On Market Momentum? Speaking of aggressiveness, when times are good (such as the current bull market), using leverage (borrowed money) to trade can magnify positive results. But leverage also has historically been one of the key ingredients to major market blow ups throughout history (for example the housing crisis and Long Term Capital Management, to name a couple). And despite our current strong market rally, the yield curve has recently flashed a warning sign in many investors' minds. In particular, long-term rates have dipped below shorter-term rates, which is often a signal of a recession on the near horizon. "We estimate the probability of a recession in the U.S. at less than 10% in the next 12 months, less than 20% in two years and just over 30% in three years." "If the mood of participants that I speak with is indicative of a more general mood, any such pullback may find interest from frustrated traders late to the party." And if you are in the bullish camp, thereby believing momentum can still carry this market significantly higher, is it time to lever up to magnify your potential returns? As we've discussed in the past, knowing when to get aggressive with your trades versus when to exhibit more "prudence" is an important art and science, as we discuss in the next section. Our trading programs were nudging us to move to almost entirely cash several months ago--which worked out well in terms of actual client account performance. However, the models and trading programs have moved back to normal trading and cash levels, and they've been performing well recently, thereby magnifying our stronger performance relative to the weaker performance when the programs held higher cash balances. And for the record, we are not using leverage, we're simply back to trading as usual. And we are sharing the performance of our proprietary trading models, as our readers have requested. 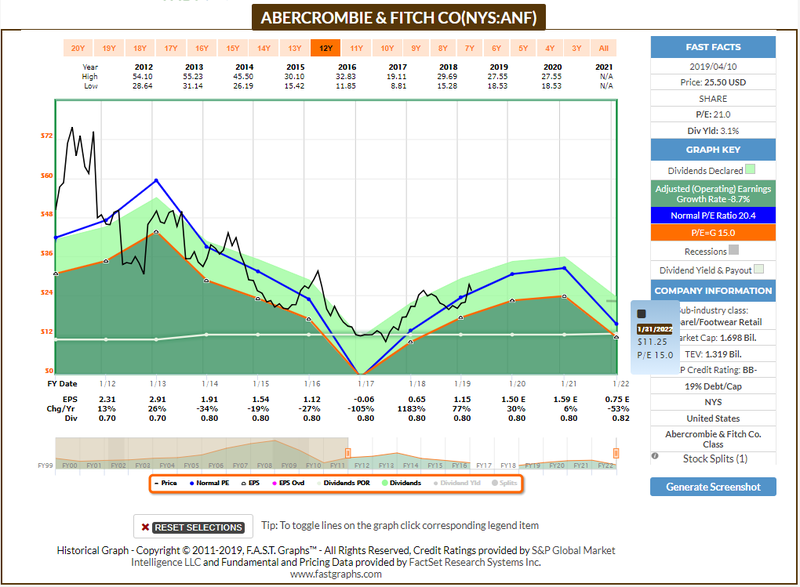 Holmes: This week I bought shares of Abercrombie & Fitch (ANF). It's a retail clothing brand. And for your information, I basically bought it on the dip, as you can see in the following chart. Blue Harbinger: Interesting, Holmes. I know you are a technical trading program (not a human) and your strategy basically involves buying on the dip. You typically hold for around 6 weeks. Here is a look at some fundamental data for Abercrombie in the following FastGraph, although I already know you're into technical trading data, not buy and hold. Holmes: You got that almost right, BH. Technically speaking, I am aware of a lot of "fundamental" data. I just use it differently. BH: Thanks for sharing, Holmes. And how about you, Road Runner--any trades to share with us this week? 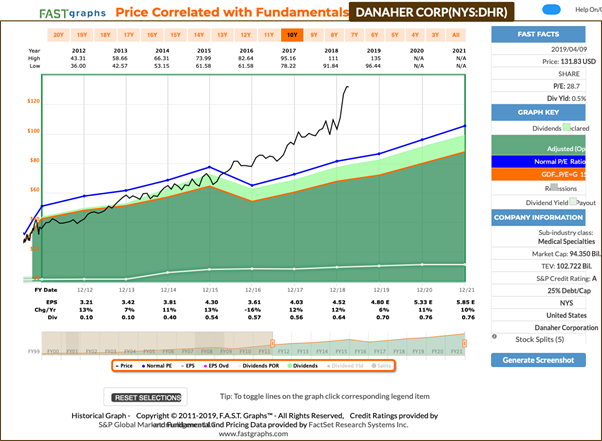 Road Runner: I bought shares of Danaher Corp (DHR) this week. If you recall, I am a momentum trader, and I like to buy stocks in the lower end of a rising channel. BH: Interesting. I think your strategy is attractive given current market conditions. In particular, if you believe this market rally will continue, then technically speaking this type of trade should work well. RR: It's a little more complicated than that, but thanks for the feedback. Anyway, how about you Felix--anything to share this week? Felix: I don't have any specific trades to share this week, but I do have a ranking to share. I am a momentum-based technical trading model, and this week I ran the 30 stocks of the Dow Jones through my model, and I've ranked the top 20 below. BH: I actually like a lot of Dow Jones names right now. I keep thinking non-Dow-Jones-type stocks have been relatively outperforming for so long that blue chip contrarian value ideas are due for a strong rally when market sentiment eventually changes. Oscar: I have some ETF rankings to share as well. As our resident sector/ETF rotation model, this week I ran our "Comprehensive & Diverse ETF Universe" through my model, and the top 20 are ranked in the following list. For example, the oil ETF (USO) is at the top of my list. When times are good, it can be tempting to use leverage to magnify returns. And while we don't do this in our own accounts, we do adjust the level of cash, depending on whether market conditions are conducive to our trading models. Knowing when to get aggressive, and when not to, is an important part of trading. The market is driven by fear and greed, and it may well be the case that there are still more fearful traders on the sidelines looking for an opportunity (for example, even a small market pullback) to re-enter some trades that will thereby extend the current market rally even higher. Disclosure: I am/we are long ANF, DHR. I wrote this article myself, and it expresses my own opinions. I am not receiving compensation for it. I have no business relationship with any company whose stock is mentioned in this article.